Kluber, at least in theory, could benefit from throwing more cutters and curves, and fewer fastballs. The fastball could still remain the primary pitch, but maybe the cutter would become a co-primary weapon. And the curve would show up in greater amounts, particularly in lesser-expected situations. Reasoning being, Kluber possesses one of the few best cutters in baseball. Kluber possesses one of the few best curves in baseball. The fastballs Kluber throws have graded out as below-average pitches, and yet Kluber’s always led with the fastball. And so the thinking went, fewer fastballs, more cutters and curves, and you wind up with a better pitcher. What you’re seeing there is Kluber’s curveball usage throughout his career, in 10-game chunks. 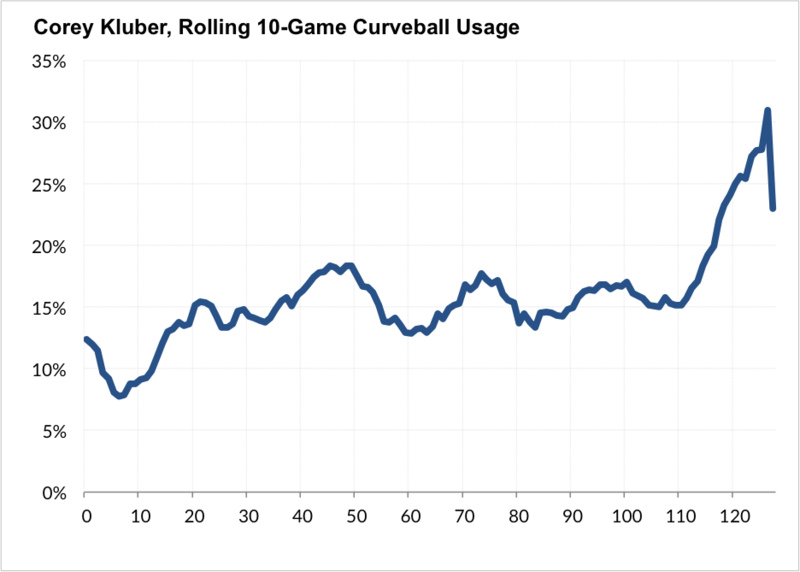 What we’ve seen from Kluber lately represents, by far, the highest curveball usage of his career. The red line indicates the All-Star break. Before the All-Star break, Kluber threw 15% curves. Since the All-Star break, Kluber’s thrown 25% curves. That 10-point jump between halves represents the second largest by any qualified pitcher, just behind Jeff Samardzija, who only recently began throwing a curveball at all. Behind an increased focus on the curve, Kluber’s been one of baseball’s most effective second-half pitchers, potentially becoming the American League’s frontrunner for another Cy Young Award. The change stemmed from a discussion between Kluber and pitching coach Mickey Callaway during the All-Star break, regarding batters’ first-pitch swing tendencies against Kluber. In an effort to avoid falling behind and getting one step closer to the strikeout, batters had begun swinging early in the count often against Kluber; his 31% first-pitch swing rate against ranks 14th among 102 pitchers who’ve faced at least 500 batters this season. With eager batters waiting at the plate, why give them a first-pitch fastball? Particularly when there exist better weapons from which to choose. Kluber’s ramped up the curveball usage across the board, but the most extreme increases have come on first pitches and when Kluber falls behind early in a count. It’s not the most well-located breaking ball, but that’s precisely why it’s being used against aggressive first-pitch swingers: it’s got the trademark Kluber break, and it gets a swing. Same trademark movement from before, but with perfect location. So why not throw it again? … and so, while it’s not the curveball that ends the at-bat, it’s the curveball that gave Kluber the upper hand from the get-go, and put Gomez in a defensive position for the remainder of the plate appearance. In the National League, a similar adjustment is taking place, and it’s taking place with perhaps the only breaking ball that acts as a true comp for Kluber’s: the one thrown by Miami’s Jose Fernandez. Fernandez has always thrown the breaking ball more than Kluber, but that doesn’t mean the usage can’t go higher. 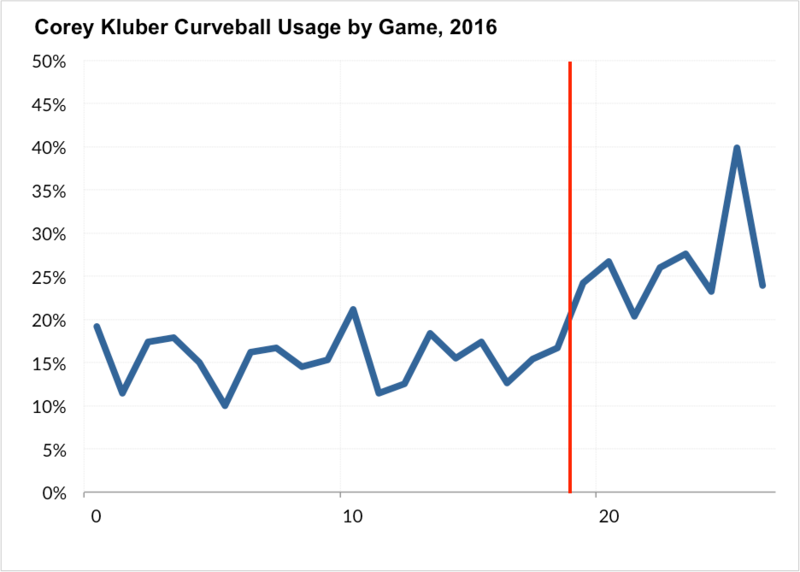 I mentioned earlier that, since the All-Star break, Kluber’s seen the second-highest increase in his curveball usage. Fernandez is fourth. Two of the game’s best curveballs — perhaps even the game’s two very best curveballs — are also the ones becoming the most prolific. Like Kluber, Fernandez’s increased usage of the curve has manifested itself largely in first pitches and when Fernandez has fallen behind in the count to left-handed batters. Like Kluber, the change spiked coming out of the All-Star break. Two starts ago, 50% of Fernandez’s pitches were curveballs — a career high. Two starts ago for Kluber, 40% of his pitches were curveballs, also a career high. Both pitchers threw more curves than any other pitch in those games, eschewing a more traditional model of pitching in which the starter is instructed to “lead with the fastball” and instead opting for a less conventional approach, similar to those employed by Rich Hill, Lance McCullers, Masahiro Tanaka and Matt Shoemaker in which the leading pitch is simply the pitcher’s strongest offering, regardless of whether that happens to be a fastball. It’s essentially starters pitching like relievers — weeding out the less effective pitches and focusing instead on getting the most out of their strengths. Hill might currently serve as the face of this approach, but it seems like it could be something of a slow-growing trend across baseball. Mark down Callaway, Kluber, and Fernandez as being on board, too. We hoped you liked reading Corey Kluber, Jose Fernandez and Maximizing Your Weapons by August Fagerstrom! August used to cover the Indians for MLB and ohio.com, but now he's here and thinks writing these in the third person is weird. So you can reach me on Twitter @AugustFG_ or e-mail at august.fagerstrom@fangraphs.com. I completely agree with Hill, if your fastball isn’t your best pitch then why are you throwing it the most? I understand that sometimes other pitches are what they are because of the fastball but there’s no real sense throwing it as much as some of these guys do. Though Fernandez has a pretty great fastball so I can see why he does but Kluber doesn’t need to be throwing it as much as he was. I assume the reason many people have to lead with the fastball is command/control. It’s easier to throw the fastball in the right spot and/or for a strike. For most pitchers, it’s much harder to pinpoint the curveball or even a changeup into just the right spot. For a pitcher who has trouble getting a strike with a curve, starting off 1-0 may be worse than the possibility of a fastball getting hit or it being a likely strike. Maybe Kluber and Fernandez just have better control to where they don’t need to worry about not having control/command of the breaking ball.